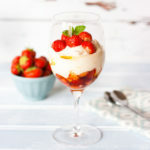 You are here: Home / Recipes / A Pimm’s Dessert – Boozy Strawberry Syllabub! A glass of Pimm’s and lemonade epitomises the English countryside. 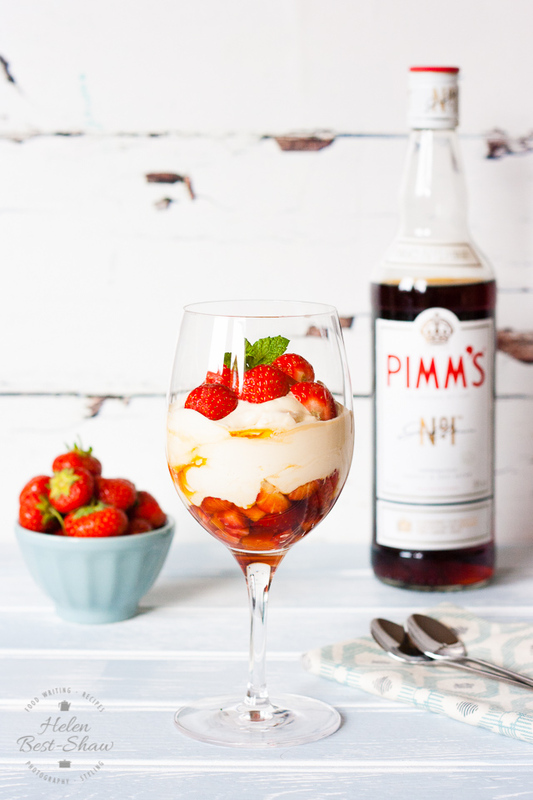 As well as being delicious in drinks try using Pimm’s in a dessert – like this quick and easy boozy Pimm’s & strawberry syllabub. I love syllabub! I really really really love syllabub – firstly it sounds so pretty and delicious; Syllabub sounds like the name of the dashing heroine in a oh-so-charming 1920’s novel. In another life I was called Syllabub, was the first of my crowd to oh-so-daringly have my hair cut into a sharp bob. You get the drift… Syllabub, syllabub, syllabub! Secondly syllabub is delicious and thirdly it is also stupidly easy to make, and if you serve it heaped into wine glass it looks so impressive. It is the perfect summer pudding for either a dinner party, or for a romantic dinner. To make this Pimm’s dessert inspired syllabub you simply cut up some strawberries, marinade them in Pimm’s. Whip the cream, adding some of the strawberry infused Pimm’s then layer it all into a glass. Chill, serve and bask in the glory of your friends compliments. Deliciously quick, easy and above all Fuss Free! For some Pimm’s cocktail recipes, ingredients, accessories and everything else you might need visit thebar.com. 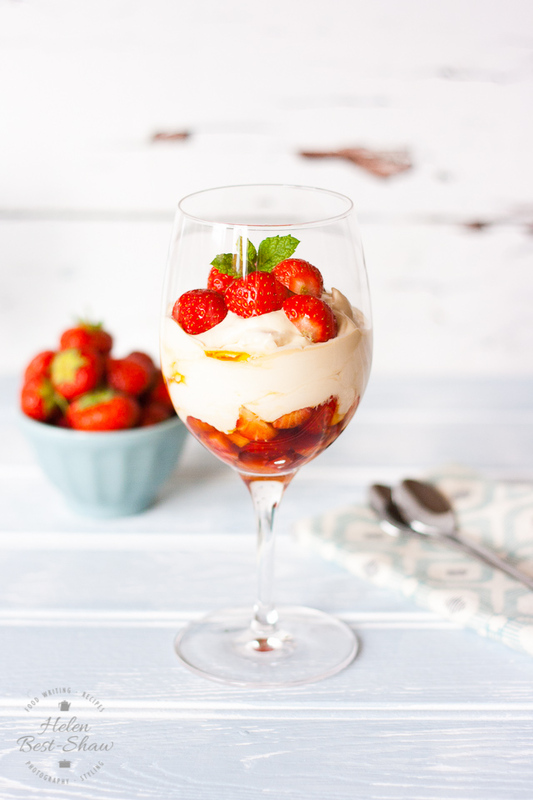 If you try this A Pimm’s Dessert – Boozy Strawberry Syllabub! please tag #FussFreeFlavours on Instagram or Twitter. It is amazing for me when for me when you make one of my recipes and I really do love to see them. You can also share it on my Facebook page. Please pin this recipe to Pinterest too! Thanks for reading Fuss Free Flavours! Pimm's for Dessert - Boozy Strawberry Syllabub! A glass of Pimm's and lemonade epitomises the English countryside. As well as being delicious in drinks try using Pimm's in a dessert - like this quick and easy boozy Pimm's & strawberry syllabub. A creamy and perfectly sweet classic treat. Place the sliced strawberries into a bowl, and pour the Pimm's over. Leave to infuse in the fridge for a few hours or overnight. in a large bowl whisk the cream, sugar & strawberry infused Pimm's together, until thickened, but still floppy. Divide the strawberries between two glasses, reserving a little of the juice. Gently dollop the cream mixture over, a jam funnel is useful to get it neatly into the glass. Smooth it down if needed.